The props will be auctioned off June 16-28 on the Boston-based online marketplace, Invaluable. LOS ANGELES, CA - DECEMBER 17: In this file photo Star Wars character R2-D2 droid brings the wedding rings during the Star Wars-themed wedding of Andrew Porters and Caroline Ritter of Australia. An R2D2 prop used in the films will be sold at auction later this week. Die-hard Star Wars fans will need to rely on more than the force if they want to bid on an R2-D2 droid that appeared in several of the franchise's movies. A couple million dollars might also help. Luke Skywalker's lightsaber, Darth Vader's helmet and shoulder armor, as well as imperial and rebel weapons are on the block, but the centerpiece is no doubt the squat blue, white and silver droid famous for communicating in a series of electronic beeps and squeaks. Representing "the pinnacle of the Star Wars collecting universe," it could fetch up to $2 million in the June 26-28 auction, according to Calabasas, California-based auction house Profiles in History. The bidding is being handled by Boston-based online auction marketplace Invaluable. Nothing like a complete R2 unit has ever been sold at auction before, said Stephanie Connell, a London-based movie memorabilia consultant not involved in the sale. "This is not just a normal movie prop," she said. "This is instantly recognizable, the creme de la creme of movie props." Connell wracked her mind, but said she could not recall any single piece of Star Wars memorabilia ever selling for anywhere close to $2 million. The 43-inch tall R2 unit for sale is sort of a Frankenstein's monster of droids, pieced together over several years from different original components used in the first five Star Wars movies. 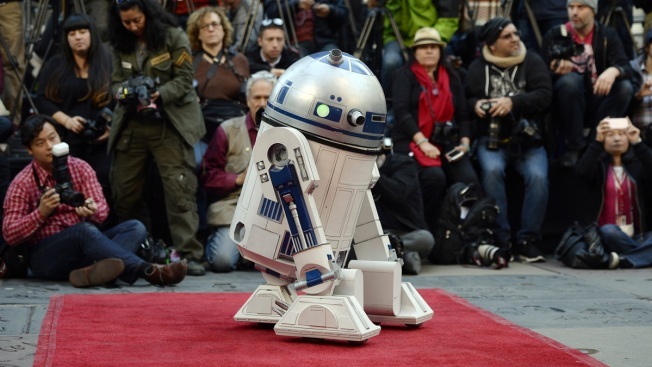 There is no other known complete original R2 unit in the public domain, according to the auction house. For the sequels after the original "Star Wars: A New Hope" in 1977, production designers took the aluminum, steel and fiberglass R2 units, retired old and worn out parts and added new features to save time and meet production deadlines. Fans outbid for the droid may want to take a shot at landing the lightsaber. Carried by actor Mark Hamill as Luke Skywalker in the first two Star Wars movies, it is expected to sell for anywhere from $150,000 to $250,000. Unfortunately, the prop does not emit a blade of blue light. The 10.5 -inch lightsaber comes directly from the archive of Gary Kurtz, producer of "Star Wars: A New Hope" and "The Empire Strikes Back," and is accompanied with a letter of authenticity signed by Kurtz. Not a Star Wars fan? Props from some of Hollywood's most famous movies are also for sale, including the illuminated disco dancing floor from "Saturday Night Fever," which is expected to get as much as $1.5 million; and the clothes worn by Leonardo DiCaprio as Jack Dawson in "Titanic." In terms of movie memorabilia, Star Wars rates as one of the most popular with collectors, right up there with "The Wizard of Oz," ''Casablanca" and the Harry Potter films, Connell said. For that reason, a collector of fine artwork or classic cars could end up buying the R2-D2. "This is something you could put right next to a Picasso." She said.